So some things, even though we see them often, we don’t really notice them. Malls in St. John’s are a weird thing. In Newfoundland as a whole, even. We seem to have different (read: lower) standards of what counts as a “mall”. Our biggest is the Avalon Mall, which is impressive until you step outside the province and realize it’s basically the equivalent of what other provinces refer to as “the lame mall,” and that our “lame malls” are really lame. Individual stores within the mall are fine or even flashy, but the mall itself is dated and weird. Last term I did a course in themeing and anthropology and now I notice themeing elements within the mall, but they’re all alone. Elements of attempts to theme by each generation of management, ending in a cluster-duck of themes that clashes badly. One of them is pictured above. It’s an old three-seater merry-go-round. We’ve all seen them. They’re not special. What is special is how long it’s been there. This ride has been in this spot since before I was born. I used to bug my dad to let me ride it, he even let me once. Now Jess’s daughter H has even outgrown this ride. I wonder if it works but won’t waste money to see. 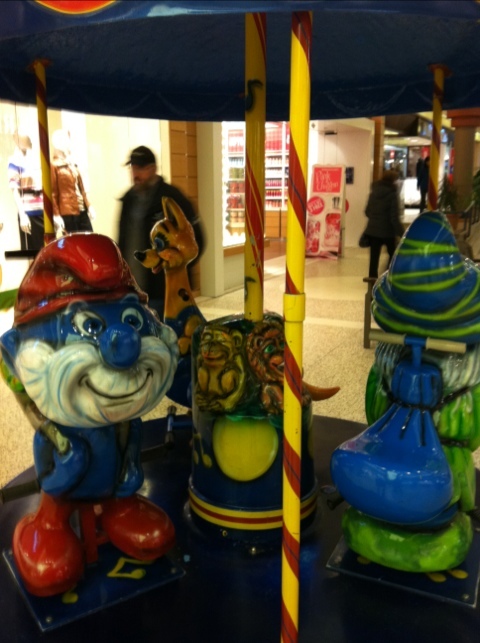 To put it into perspective: this ride was put in when the Smurfs were popular the first time. It remained all through their obscurity, and now that they’re popular again this ride is at least relevant. In that sense, leaving the ride is almost prudent planning. Previous PostNewfoundland Summer?Next PosteBooks come to the Engen WebStore!